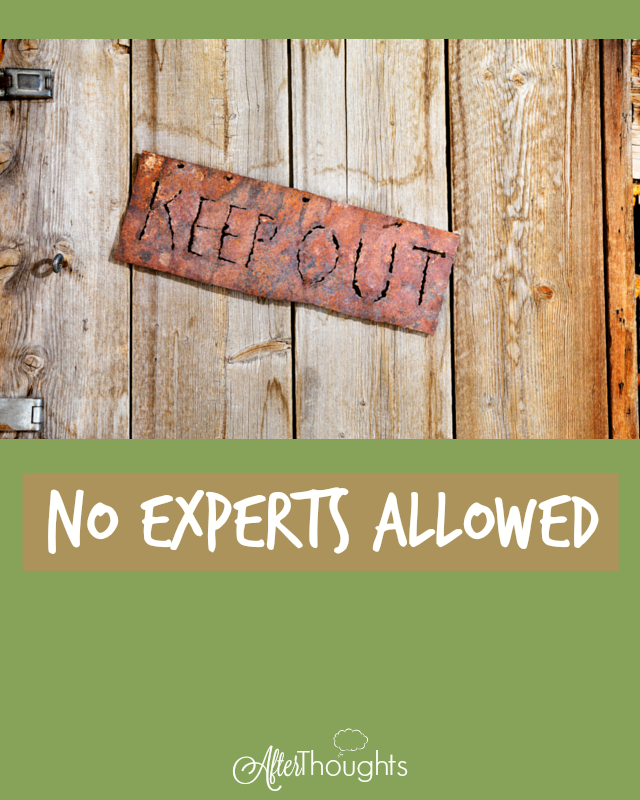 Keep Out: No Experts Allowed! I couldn’t lead a Charlotte Mason group,” she said. “I’m no expert.” In the nicest way I could think of, I told her I thought she was wrong. I thought she was exactly the sort of person to do it. And, as far as I know, she is doing it now. 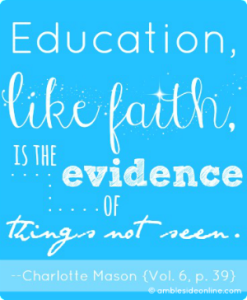 In the Charlotte Mason world, there are very few experts, at least in the way that I think of experts. 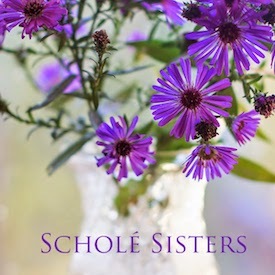 We tend to be homeschoolers, after all. Homeschooling is the bastion of the amateur. And that, my friends, is the word we want: amateur. An amateur, you see, is one who loves. Love, being the heart of true study, is where we want to begin, and something we want to remain, even when we’ve come to know a lot more than when we started. We don’t want Charlotte Mason’s philosophy professionalized and institutionalized and given its own fancy academic language and eventually becoming inaccessible to normal folk. Probably the reasoning behind a statement like “I can’t lead a Charlotte Mason group (or other book group) because I’m not an expert” is something like this: I don’t feel like I’m far enough down the road in my experience, or wise enough in general. I shouldn’t be held up as an example. You know what? It’s probably true! 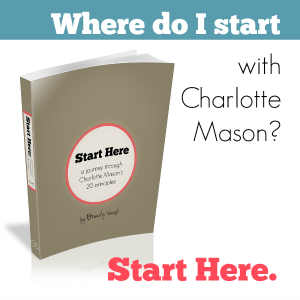 When I first started leading a group, I had about 18 months of actual Charlotte Mason experience and I was young — barely over 30. Did I think I was “expert” enough? The thing is, I never thought leading a group like this required an expert. It needs someone to organize, yes. But, my dears, why don’t we all be content to let the author be the expert? 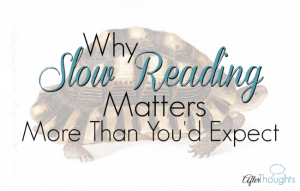 We don’t have to already know — that’s why we’re reading the book. We can all be co-learners. I’ve been leading book groups for many years now, and you know what? I still learn something new at every single meeting. I know this might sound shocking, but my train left the station years ago and still hasn’t arrived at my destination. Because it’s all a journey. Yes, some of us have been on the rails longer than others. That’s true. But I really don’t see what that has to do with leading a group. If you can set a date and time, find a location, and make a reading assignment, you can lead a group. (Actually, I’ve even made some reading assignments for you, if it sounds scary to do that part.) The ability to serve coffee nicely is an added bonus, but not a requirement. I’ve met so many people lately who say things like, “I wish I had a group,” but when I suggest starting one, they get this deer-in-the-headlights look. You know what? It’s not so scary! And if you have the love, you’re going to do just fine. Think about what is stopping you. For me, it was all the logistics. I can’t get my housekeeping together well enough. Fine, we can meet at a coffee shop. For others, it might be childcare. Fine, have a small group come over after the kids are in bed. And if your hangup is not being an expert, let. it. go. You’re not an expert? Fine. You’re not well-educated? Fine again! 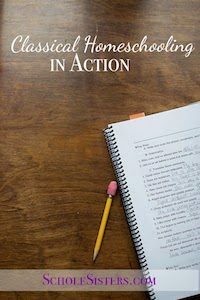 Homeschooling will give you a better education than you initially received. You’ll be awesome in 12 years or so. All you really need is love and a few organizational skills. Yes! I am no expert but LOVE the method. I think that’s probably obvious to all the people in my group. 😉 I learn something new at every meeting too, which is why I so enjoy reading and meeting with others. Phew! Glad to hear we don’t need to be experts because my friend and I are leading a book club and neither of us are experts or anywhere near. ?. We are currently reading For the Children’s Sake and we all are learning so much! What if no one is interested in putting in any effort? I’ve tried multiple times to start a group but I get answers like this: “I don’t have time to read.” I can’t make time in my schedule.” I don’t get this at all! I can’t help but read. I wasn’t even asking much. Once a month 1 chapter. Any thoughts? Or should I just keep praying for the right people to eventually come into my life? I really think that a “group” can be even you and only one other person. 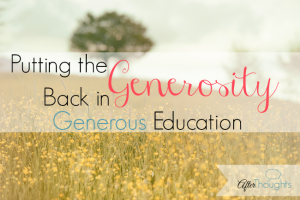 My local group actually started when God answered my prayer for *one* friend who was doing homeschool this way — I had no idea it would grow over the years! I’m so glad you said that, Brandy, because that’s always my problem as well. A couple years ago I tried to start a weekly nature study group. I had over 50 responses. When it came to actually meeting, it was never more than 2 or 3 families, oftentimes just 1. Now that I’m leading a monthly CM meeting, to which I also had overwhelming response, I only ever have 1. Part of the problem is our county is HUGE, and a lot of families are too far. So I type up summaries of our meetings and share them with our group (we’re on Facebook and Yahoo). I don’t always get responses but a lot of times I get a thank you, and hear that even the summary is encouraging. I’m right there with you, Heather! Every mom I meet who actually does read is already in a book group and/or Bible study and feels she can’t take on something else with outside reading required. But most people are either not interested or say they don’t have time to read or time/childcare to meet. I’m currently experimenting with doing a monthly video chat (we’re talking about Teaching from Rest over three months) so I can draw from a wider area and at least get rid of the driving/childcare/meeting place hurdle. Seeing people’s faces and having an actual conversation has so much value, and is far better than trying to do a book group discussion via text. I’m not sure I’d say it is an unqualified success so far because I think it is easier for people to forget or not prioritize an online conversation over a out of the house meeting, but at least something is happening! I think doing something where there is a limited time commitment – say a certain number of meetings, rather than something ongoing – is easier for people to say yes to. The video chat is great in that it opens up possibilities for people, but the technology aspect is daunting for a lot of women (even though it is really quite simple!). I met someone at the conference in Seattle who did this quite successfully last summer. I think she used the first three sessions from here: http://www.charlottemasonincommunity.com/hosting-information-sessions.html as her guide. It is an idea that I’m kicking around myself. It would be interesting to do something like this and try to get it out at local Moms/MOPs groups, preschools and churches as well as the existing HS’ing community. 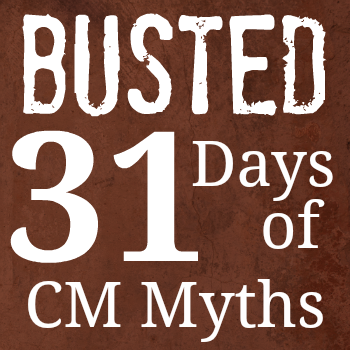 Even though their kids aren’t ready for Y1, they could really benefit from learning more about CM and could become the start of a great CM community. I so appreciate everyone’s kind thoughts and prayers! I’m up for anything at this point! I never thought of meeting over the summer but it is worth a try for sure. I’m also mulling over what Amber said of meeting once for a specific topic and how that might play out. Thank you ladies! Ooh! One other idea: last summer, we did the videos from Perimeter School. No reading required! 🙂 There are three videos, so one per month works perfectly. This is encouraging to read. I lead a monthly group (in San Diego, if any readers here are interested in joining), but I have a lot of insecurities about it. Not because I’m not expert in the method, but because I know I’m not living it out perfectly in my home and homeschool. 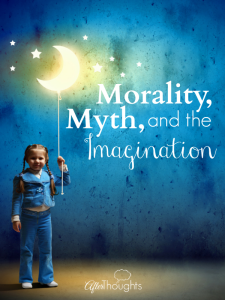 My kids certainly aren’t exhibiting good habits–that is one of my weakest points. And I know I need to work on how I teach the subjects and narration and nature study and so many other points. So I love leading it, I love teaching other moms. I just sometimes feel almost like a hypocrite because I know I’m not doing it right all the time. I’m just upfront with the people, though, that I’m learning alongside them and growing with them, and not doing it exactly right, but I’m trying. Thanks, that’s exactly what it is. Hi Jenna!!! I’m just seeing this, I forgot to select the “send email notification” option! LOL Yet something kept nagging me to come back and check for responses (hmm, some THING or some ONE .. .).